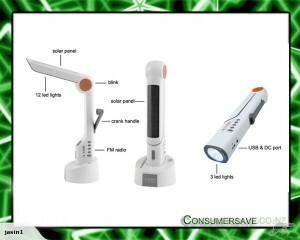 Multifunctional Hand Crank Dynamo LED Lamp with Radio, Solar Panel, Flashlight, USB Port and built-in Power Bank. Listen to the radio, read in comfort, charge your gadgets and more, all with this one gadget! This 5-in-1 multifunctional LED lamp will not only serve as a desk light when placed in its holder, you’ll also be able to use it as an emergency flashlight or back-up power bank. Powered by either the sun or by hand cranking the dynamo, you’ll always have a fully charged lamp at your disposal! The desk lamp consists out of 12 bright white LEDs which can be directed up or down to suit your needs and the brightness can easily be adjusted. Listen to the radio through the built-in speaker and if you need to charge your gadgets, just hook them up to the USB port and charge them off the 1500mAh strong built-in battery.